What Big Eyes You Have (2004) by Van Sowerwine comprises a seemingly benign plywood box with peephole and handle. 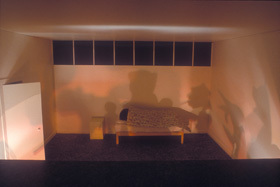 Inside the box is miniature scene of a young girl in bed at night. Like a child's toy, the box invites us to turn the handle, to interact. Yet instead of pleasure this action animates nightmarish spirits on the wall behind the bed suggesting the unknowns that lurk in dark places. In this old-fashioned mode of animation, the viewer is complicit in creating these visions. As with much of her work, including the highly acclaimed short film Clara and her 2005 series Sharper Than A Serpent's Tooth which featured in the Melbourne International Arts Festival and was also shown at Stills Gallery, Sowerwine combines the innocence of youth with darkness or distress.